Learn to count, how to count it and how to use what you count. In Web Analytics Academy you'll discover why most web businesses are flying blind, failing to have the right key performance indicators in place and why many more waste energy tracking the wrong thing altogether. Find out what to trust and what to ignore. Get it right and your marketing becomes truly trackable and your KPIs really meaningful. It's not about the technology, it's about the people. That may seem like an odd learning point for a web analytics Academy, but while every website has a smart stats package, how many firms have 'data analysts' to interpret what it says or act on what they learn? If you do then rest easy: you're well ahead of the pack and gaining ground on your competitors. Our advice? For every dollar spent on software, put ten or more into the people who interpret it. Get your resources right and you'll be able to unlock the real value of understanding where your customers are going. 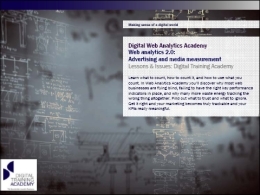 Use the Web Analytics Digital Classroom for questions.